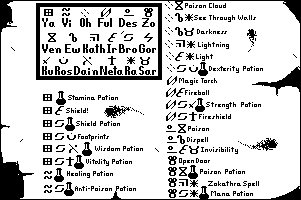 NOTE: Power symbols are omitted from the above spells. Use power levels that your champions can handle according to the situations encountered. The power symbol can be entered before any of the above symbol combinations. NOTE: Using the TRANSMUTE function of the FireStaff activates a powerful DES EW type spell. Wunnerful stuff, this. ZO KATH RA Creates glowing ball which is placed on fire gem and frees it from its holding gel.